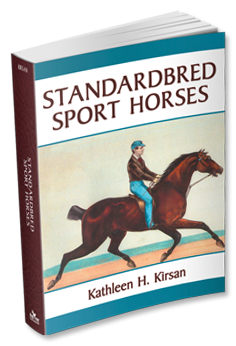 "Standardbred Sport Horses by Kathleen H Kirsan, is an expertly researched and superbly written book about the importance of the Standardbred in the breeding of top sport horses. As a research writer for the Equine Heritage Institute, I truly appreciate the vast amounts of information and the unraveling of facts that are in this book. As Kathleen aptly points out, Americans have become out of touch with our own equine history and resources. Most riders look to warmbloods for their sport horse mounts not realizing that the ability to achieve in sport came not from the warmblood breed base but the addition of true sport elements into the breed--the English, Irish and American sport breeds. Her genetic research and historical references provide proof that the Standardbred is a "versatile and exemplary sport resource". Before looking for your next sport horse, be sure to read this book. " Following are a few reviews of my books written by professionals in horse breeding. Kathleen Kirsan's first book ' North American Sport Horse Breeder' is the most important book for breeders of horses in any discipline--including western horses, stock horses, Arabs, the Olympic disciplines, racehorses and even dog breeders. It is the only book of its kind for sporting horse breeders who want to learn how to read, analyze and understand horse pedigrees--how to begin to understand our own horses genetic makeup--how to choose genetically suitable stallions for our mares--how to breed top broodmares and stallions--and how to recognize which stallions have great producing powers. The most important question for any breeder is--how do I choose the right stallion for my mare? This book outlines the answers to this question using the scientifically proven methods of the pedigree experts. It examines the pedigrees of some of the superstar sires and performers of the past and our time--and how we can use these examples as roadmaps to construct our own matings using the methods of linebreeding to superior sport ancestors. This book also examines the important TB sport lines which all our horses have, and how to utilize these for our own benefit. This book changed my life and the entire direction of my breeding programme. I am forever grateful to Kathleen for this and urge other breeders to take advantage of the opportunities presented in this book and all her future books. Kathleen Kirsan is an American horse breeder and author, who has spent the last two decades researching and studying the pedigrees and origins of thoroughbred and sport horses. This has led to the development of her highly regarded "Sport Horse Breeder' website where she advises on successful breeding strategies using knowledge and statistics provided by past masters augmented by her own research and to the publication of her first book "North American Sport Horse Breeder". Her latest book, "Legacy of Lexington", is a mine of information on the contribution of the American Thoroughbred to worldwide racing and sport. It features in particular the factual history of the outstanding stallion, Lexington, an American Running Horse whose legacy, partly forgotten--partly ignored, is rightly placed on record in the worldwide context of racing and breeding . In his lifetime, 1850-1875, Lexington, the outstanding racehorse of his time, set a world record time over four miles and headed the American stallion list for a record sixteen years. Both records still stand. But it is his influence on the thoroughbred breed right down to the present day that is his greatest legacy. In "Legacy of Lexington" the author achieves much more than the title suggests. She explains the history of American racing and the American Running Horse, both of which predate the establishment of the American Thoroughbred breed by 225 years. In fact, according to the author, the American Running Horse breed of that era reached a pinnacle of performance in speed and stamina that has not been equalled or surpassed by any breed of racehorse worldwide. She explains the origins of the British Thoroughbred and how crossing it with the American Running Horse base produced an American Thoroughbred that was so superior to its British counterpart that it was banned from inclusion in the General Stud Book for spurious reasons under the Jersey Act from 1913 to 1949. This effectively impounded it in North America but paradoxically led to further consolidation of the strong American bloodlines so that when the export of American Thoroughbreds to Europe resumed in the 1960s its superiority continued, ultimately resulting in the worldwide diffusion of these outstanding genes when Vincent O'Brien & Co. invested their faith and fortune in Northern Dancer's colts. The rest as the say is history. Unfortunately, when the history of thoroughbred breeding is discussed and written , what happened before this seminal 1970s era is largely, and sometimes conveniently forgotten. The author has redressed the balance and brought this vital information into focus and context, including the facts that what many regard as the ultimate British Thoroughbred stallion of modern times, Sadlers Wells, was born and bred in North America--and has over one hundred lines of Lexington in his pedigree! She also addresses the sport horse industry and in particular the contribution of the American Thoroughbred to so many successful sport horse breeds. She pulls no punches in using hard facts to contradict the skewed promotional narrative of some warmblood governing bodies who promote their original native breeds as the jump source of their present-day breed and show clearly that the Thoroughbred is the common improver and the main jump source in all these breeds. She devotes a chapter to the American Showjumping Hall of Fame inductees and traces their bloodlines. Amazingly, most go back to the same Thoroughbred root stock that provided the jump source for most modern warmblood breeds! She then outlines how the warmblood experiment has failed in North America and why breeders should go back to the Thoroughbred and the breeding methods that produced such outstanding horses in the past. She explains how modern breeders can identify and harness these thoroughbred jump genes for their breeding programmes using the line-breeding methods developed by Frederico Tesio, the worlds most sucessful thoroughbred breeder and refined by equine scholars, historians and statisticians. 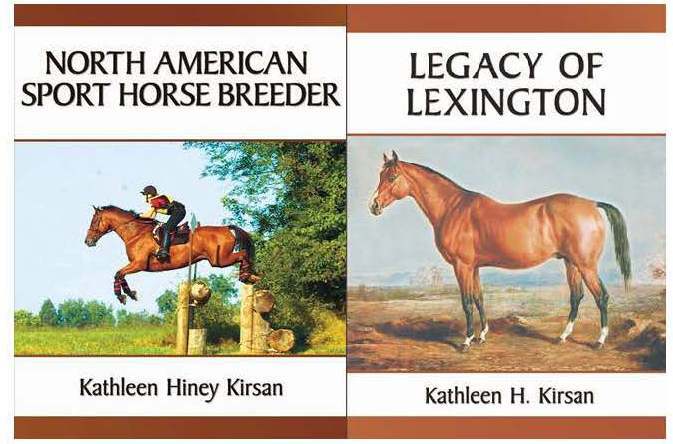 The product of years of meticulous research and study, this book is a treasure trove of breeding knowledge and no matter your role or interest in horse breeding or sport, "Legacy of Lexington" has something for you. It is illustrated by excellent photographs and drawings which enhance the readers experience and brings them right back to the particular period under discussion. "Legacy of Lexington" is a great read, both for professionals in the thoroughbred and sport horse industries and for those with a general interest in horse-breeding and history. "Ms. Kirsan has given the equine world great work on the sport horse. In so doing, her dedication has laid out an amazing dynamic of the thoroughbred horse gene pool--the impact of sons of Diomed, he a grandson of Herod and the winner of the first English Derby...Ms Kirsan has described it in detail and I hope her work is taken to heart by her readers." "I admire your research discipline in going back to the roots of the Thoroughbred in America, and as a sport horse breeder you seem to know a lot more about Thoroughbred pedigrees than most Thoroughbred breeders do!" Books available for 20% off when ordered from this site.